Dave Splash Dot Com: Fringe Re-Cap: "Amber 31422"
Another first-rate Fringe last night, as the show continues its rise to the top of the sci-fi heap. In Amber 31422, we follow our Olivia Dunham as she struggles with her identity in the alternate world. There are only a handful of people who know that the Olivia Dunham in the alternate world is not where she is supposed to be, and even fewer know the reverse. But pretty much anyone can see that Olivia is not fully "recovered" from her "breakdown" a few weeks ago. Her partner Charlie has even floated the theory that Olivia is not who she says she is. The main gist of this episode is what the fringe division and the Department of Defense have been using to quarantine areas of the country deemed too unstable for life. They use a chemical called "Amber" that freezes those people stuck in a quarantine zone in place. For decades, the government told its citizens that those trapped in the Amber were effectively dead, and could never come back. Turns out, that is not the case. The fringe team is assigned to investigate some activity near a quarantined zone. The people there had been frozen in amber for four years. Yet someone new is there - also frozen in amber - and one person is missing. Turns out, twin brothers - one a criminal, one a good citizen - were behind it. The criminal brother, assumed to be the one frozen, was actually on the outside and he was trying to rescue his brother. He did rescue him, but in the process, got his accomplice frozen. Oh well...no honor among thieves, I guess. During the investigation, only Olivia senses that the brothers switched places. It is her dogged pursuit of the criminal brother that resolves the case. It is a neat tie-in to another sort of crisis involving twins: Olivia and alt-Olivia. Our Olivia (the real one) is still having issues with her identity. She still keeps seeing Peter everywhere, and his presence is a constant reminder that she is in the wrong place. While she tries to dismiss his appearances and the correctness of what he is saying, Olivia is continually dogged by feelings that she is not in the right place. She takes some form of pill to keep her mind straight, but it is not working well enough. 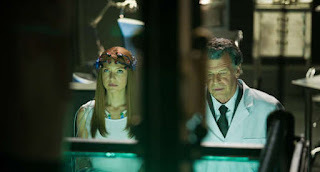 At the same time, Defense Secretary Bishop is ready to take Olivia to the next level and experiment with her ability to cross universes unharmed. Olivia is eager to participate in the tests as she sees it as a way to understand better what is happening to her. Bishop, however, knows that Olivia is from the other side, and is using her for her knowledge. They immerse Olivia under water for sensory deprivation, and inject her with psychotropic drugs. After giving her doses of the drug that no ordinary person could take, Olivia is somehow transported to the other side. She knows this based on something Peter said in one of her visions of him. He points out some key differences between the two worlds, with the main one being the absence of the Twin Towers in our world (and that Olivia's sister is alive there as well). In her brief trip, she does go to the other side. When she returns, Sec. Bishop is elated, and begins planning for the next trip. Over the course of the next few days, Olivia is continuously haunted by Peter's continued appearances. Her pills aren't working, and telling herself that he is not real isn't either. After her Mother visits and senses something is wrong, it becomes increasingly clear to Olivia that she is not who people think she is. To test her theory, she goes back to the lab and asks to be immersed in the water again. During this trip to the other side, Olivia exerts more control. She is in the same place she was last time, and notices the absence of the World Trade Center. However, this time, she remembers that in her vision, Peter told her it was her niece's birthday. She finds a phone and calls her. Seeing that in this world, her sister is alive and she has a niece (who is having a birthday), it becomes crystal clear to her that she does not belong back on the other side. Peter is right. When the trip to the other side is over and she is pulled out of the water, Olivia lies to Secretary Bishop about what happened. She said it didn't work and that all she saw is black. I sense that Walter knew she was lying. Either way, I think that the charade of Olivia's life on the other side will soon be coming to an end. She clearly no longer trusts the Secretary. The extent to which she can fool others long enough to leave remains to be seen.